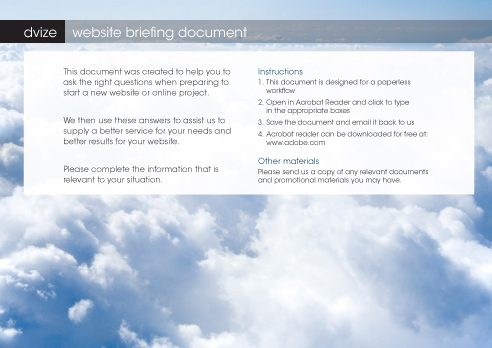 This is the document we use to ask questions of our clients to allow us to put together an effective brief. From this we can then create a quote, recommendations and strategy. This is an interactive PDF, designed for a paperless workflow. We recommend that you put a cover page at the front and rear of the document that contains your company branding and also the instructions for your client. This summary represents a lot of our commercial process and IP. If you are using this in a commercial context, please donate. Acrobat will prompt you to make a copy. Make the changes using the Indesign working file. Click on “Appearance” and set the font size. This allows the text boxes to scroll and create a consistant font size. By default, the text shrinks. Save the PDF. Open in Acrobat reader and test all the fields. This document was created to help you to ask the right questions when preparing to start a new website or online project. We then use these answers to assist us to supply a better service for your needs and better results for your website. Please complete the information that is relevant to your situation. Please send us a copy of any relevant documents and promotional materials you may have. What is the required completion date? Who will be involved in decisions regarding the website? Existing suppliers or partners we will need to work with? Do you own the rights to all materials to be included on the website? Is the website for your organisation or a specific product, event, service or offer. Outline what this is. (elevator pitch)? What does your website need to achieve: traffic, sales, response rates, leads generated, reputation? Target Audience – Who is the website aimed at? What tasks do you estimate are required to update and promote your website? Who will be updating and promoting your website? What level of computer and internet skills do they have? What is the estimated weekly budget of hours to update and promote the site? Top five search terms (words or short phrases) that people will use to find your website? Please list the website addresses of the social media and other external websites linked to this project (eg facebook, twitter, youtube, ebay)? Are you planning on integrating further social media and other external websites/services? Please list them. Do you need your new social media profiles setup? Do you require accessibility compliance such as WCAG 2? Will the website be viewed on any special screen size or device? What types of content will be on your website – eg text, photos, audio, and their current format – eg digitised, hard copy? What content has currently been produced? What new content needs to be produced? Do you need assistance producing the new content? Do you have any other related materials such as marketing? What levels of traffic is it currently receiving? If possible please provide access codes to your statistics package. How is your website performing for your objective?